"It's my turn to lead a charity quilt for the Faith circle of do. Good Stitches. Woohoo! This time I took inspiration from one of my very first Flickr "favorites", an image by Philistine Made (see second image to the side). 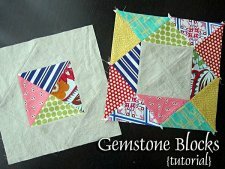 "I don't recall if I've seen this quilt block anywhere else, but I imagine it has some traditional heritage. 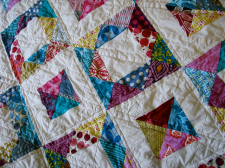 Don't you absolutely adore the triangle-pieced squares and reversed layout she's used? Simple, but delicious! Something about the way the triangles intersect reminds me of sharply cut gemstones."